Dentures have a lot of problems. They reduce your chewing efficiency, slip, and even fall out at embarrassing times. But, the worst problem is the bone loss that is an inevitable result of removing all your teeth. Once they are extracted, your body efficiently begins to re-absorb the minerals to use elsewhere. After ten to twenty years, you won’t have enough jawbone left to support your dentures. You become a dental cripple. Fortunately, there is a way to avoid these issues with implant overdentures. How do implant overdentures work? 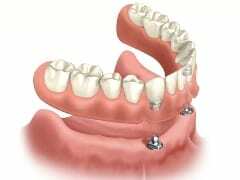 Implant overdentures are simply dentures that are secured to your jawbone with dental implants. The simplest overdenture can be seen on the left. It snaps onto two implants in your jawbone. You can get more than two implants. Obviously, the more implants you add, the more secure your dentures will be, but budget restrictions may determine how many you are able to get. 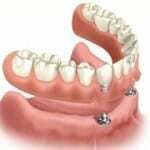 For the best stability, you would get four to six full-sized implants that the dentures can attach to. This will keep your dentures from moving at all, preventing any embarrassing slips. It will also greatly improve your chewing efficiency. If you’re looking for a way to anchor your dentures, you may call our office to schedule a consultation, or you may click here to request an appointment online.